In 1885, when Eliza R. Snow penned her life sketch for historian Hubert Howe Bancroft, she recalled with pride the extensive travels that for seventeen years had defined, in part, her work with the women’s Relief Society of The Church of Jesus Christ of Latter-day Saints. “I have traveled from one end of Utah Ter. to the other—into Nevada & Idaho, in the interests of these organizations—have organized hundreds of the Young Ladies’ and Primary Associations since their introduction,” she wrote.1 Known among Latter-day Saints during the 1830s and 1840s as a poet and writer of hymn texts, Eliza Snow, in the 1850s and 1860s, officiated in women’s sacred ordinances in the Endowment House in Salt Lake City and became known as “priestess.” Through the 1870s and 1880s, she stepped outside the Holy House to labor in local wards with women, young women and children and serve not only as Relief Society president, but “President of the Latter-day Saint Women’s Organizations,” and “the recognized leader of the women of the Latter-day Saints.”2 She was a shepherd who knew her flock of women and children and they knew her. For nearly twenty years, like an itinerant preacher, she visited them unceasingly. Her five-month sojourn in Southern Utah during the winter of 1880-81 is an illuminating example of her movable ministry and pastoral outreach. “I spent the Autumn & Winter of 1880-1 in St. George, officiating in the Temple for the dead, and visiting and organizing Associations in that interesting City, and adjacent country—having traveled one thousand m[ile]s by team over jolting rocks and through bedded sand, occasionally camping out at night on long drives,” Eliza wrote in her life sketch.3 Except for her nine-month trip to Europe and the Holy Land in 1872-73, the southern tour comprised the longest time and distance she traveled away from Salt Lake City, and she never forgot it. Nor did those whom she visited forget. “One of the most unforgettable things of my life was when Eliza R. Snow came to Cedar City in 1880 to organize a Primary Association,” Violet Lunt Urie recalled.4 The southern tour, executed at the height of Eliza’s ministry among Latter-day Saint women and children, provides significant insights into both the minister and her ministry. No Eliza Snow diary for this period has yet come to light, nor do we have more than three or four of the many letters she wrote from St. George. Nevertheless, newspaper articles, rich local minutes, and personal diaries and reminiscences of Dixie Saints furnish a fascinating picture of Eliza at the apex of her formal and informal power. Eliza first visited the southern settlements in 1864 in company with Brigham Young and a large group of family members and church leaders.5 Though Brigham Young went to southern Utah at least a dozen more times before his death in 1877, Eliza did not accompany him. After 1868, when Brigham Young called her to help bishops organize Relief Societies and then to preach to women, she traveled extensively, accompanied by other leading women, first moving northward as far as the Cache and Malad valleys and, by 1878, venturing as far south as Manti. 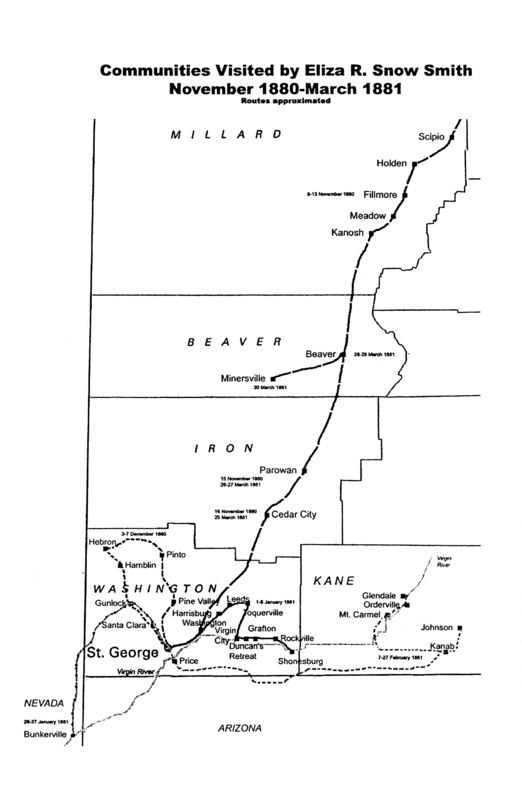 But the settlements south of Nephi, along the route that is now Interstate 15, did not see her until she spent five months there during 1880-81. After that, she never again crossed the southern rim of the Great Basin. Eliza did not make the 1880-81 trip south alone, but in the company of her dear friend Zina Diantha Huntington Young (1821-1901) who, like Eliza, was a plural wife first of Joseph Smith and, after his death, of Brigham Young.6 During their southern tour, three years after Brigham’s death in 1877, Eliza and Zina celebrated their connection to Joseph. Repeatedly, they were honored as “wives of the Prophet Joseph Smith.” Added to this significant family connection was new organizational stature. Five months before the two women began their journey, in June 1880, Eliza was called and sustained as general president of the Relief Society and Zina as her first counselor.7 And the St. George Temple, as Eliza noted, played a central role in the women’s southern labors. Between November 1880 and March 1881, Eliza and Zina circled through a string of thirty-two settlements and visited Relief Societies, Young Ladies organizations, and Primary Associations. Week after week, their circuit brought them back to the temple where they forged sacred connections to their families and to Joseph Smith. Eliza was seventy-six years old in June 1880 when she was appointed general president of the Relief Society and, as Maureen Ursenbach Beecher has shown, she traveled with particular intensity during the next twelve months.8 Just how long or extensively she planned for the trip south is unclear. A 3 November 1880 article in the Deseret News notes “Sister Eliza R. Snow and Zina D. Young are contemplating a trip to St. George, before winter sets in. They will start within the next fortnight probably, and return in about a month afterward.”9 In fact, they left five days later and were absent five months. What seems to have been originally planned as a visit to St. George, the temple, and members of the Young family and numerous friends, expanded to include visits to nearly every settlement in five Utah counties: Millard, Beaver, Iron, Washington, and Kane. There were Relief Society sisters to comfort and counsel, young ladies in Mutual Improvement Associations to instruct, and Primary Associations to organize. Eliza and Zina moved from ward to ward to complete this organizational work; their endless meetings and public speeches formed a prominent part of their trip south. Their quieter days spent in and around St. George, at the temple and with friends, were an equally memorable aspect of the trip. Both the institutional and personal dimensions of their extended visit in and around Washington County will be better understood if prefaced by a review of why it was not “Miss Snow” but “Mrs. Smith” who went to Washington. “Aunt Eliza” or “Sister Eliza” or “Miss Eliza R. Snow” retained her maiden name until 1880, when in May, six months before she headed south with Zina, she took Joseph Smith’s name and became known as Eliza R. Snow Smith. Eliza’s new name and her declared relationship to Joseph Smith had significant repercussions throughout her southern tour. 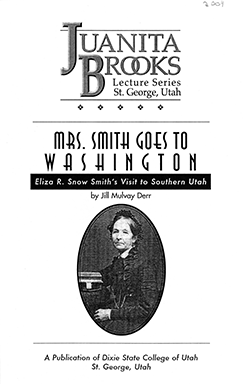 Thus it was Eliza R. Snow Smith who joined her sister-wife and friend Zina D. H. Young for a five-month visit to southern Utah that served both institutional and personal purposes. The women’s extensive organizational work—visiting different settlements to organize and assist local branches of the Relief Society, Young Ladies Mutual Improvement Association and Primary Association—will be the focus of the first part of this discussion. The second part will feature Eliza and Zina’s visits with friends and their work at the St. George Temple. The two parts cannot be neatly divided, however, since the women’s institutional and personal circles inevitably and frequently overlapped. On Friday, November 19, they organized a Primary Association at Washington, then pushed on to St. George, arriving before the end of the day. Church headquarters for the southern settlements, St. George was to be their headquarters for the next four and a half months. They settled in with stake Relief Society president Minerva Snow and spent the next two weeks laboring in the temple and visiting ward Relief Societies, Young Ladies’ Mutual Improvement Associations and Primary Associations in St. George, Washington, and Santa Clara. Abbott’s account suggests that men as well as women attended and enjoyed meetings convened by the visiting Relief Society leaders. The sisters’ visits to settlements in Kane County took nearly three weeks, from Monday, 7 February to Sunday, 27 February. Church teamsters transported Eliza, Zina, and Minerva across the desert wilds, probably along a southern route near what is now the Utah-Arizona border. “Going and returning we camped out three nights. On our outward trip we camped at the foot of ‘Hurricane Hill,’ on our return, on its summit.” Eliza reported. She noted that “to sit around camp fires, to eat our suppers by their light, and to breakfast in their warmth” reminded her of “our bygone experience,” that is, the 1846-47 trek across the plains.31 At Kanab, the ward held a Friday evening social in their honor. Three hundred people attended the “ample picnic which caused what Sister Smith called a delightful confusion.” The next day, Saturday, the visiting sisters organized ward and stake Primary Associations, and on Sunday they met with Relief Society women and Young Ladies and organized a silk association. On Tuesday they traveled north and west of Kanab to the settlements in Long Valley: Mt. Carmel, Orderville, and Glendale. They held meetings in Orderville on two different days. “The Sisters addressed us again the house was very crowded quite a number of the brethren and sisters of Glendale came to meeting,” Thomas Chamberlain noted in his diary on Sunday, 20 February.32 Eliza was particularly impressed by her visit to the community known for its United Order. “The longer I stayed in Orderville the more home feeling I realized,” she wrote. “The people seem united and happy; those that are able are indomitable workers—the invalids and aged sharing liberally the fruits of their toil.”33 The women traveled back to Kanab, spent a day visiting the ward at Johnson, and then returned to Kanab where they met with the sisters “at their sewing meeting.” They departed for St. George on Friday, 25 February. Eliza R. Snow Smith and Zina D. H. Young, president and first counselor in the general presidency of the Relief Society, had traveled nearly 1000 miles to meet with their sisters and cultivate the women’s organizations in southern Utah. Eliza was considered the “President of the Latter-day Saint Women’s Organizations,” because she played a unique role in organizing and overseeing not only the Relief Society, but also the Young Ladies’ Mutual Improvement Association and the Primary Association. That role had developed over time. Originally, in April 1868, Brigham Young had called her to assist bishops in re-organizing ward Relief Societies and to instruct her sisters. In May 1870 she helped organize first retrenchment association among Brigham Young’s daughters and then traveled to various wards to organize young women in what quickly became known as the Young Ladies Mutual Improvement Associations. Though Aurelia Spencer Rogers organized the first Primary Association in Farmington in 1878, it was Eliza who had helped Aurelia get the endorsement of priesthood leaders, and it was Eliza, accompanied by other leading sisters, who traveled the territory yet again to organize Primary Associations in each ward. At this moment in time, bishops and stake presidents called Relief Society officers, but Eliza and other Relief Society leaders were authorized to select and call ward and stake presidents of the Young Ladies Mutual Improvement Association as well as the Primary Association. Eliza and Zina’s visits to the wards and stakes of southern Utah illustrate the distinctive purposes of each of the three women’s organizations, as well as the important interface between them. One of Eliza’s great strengths as a leader was her capacity to encourage and to elevate, to spark in women of all ages a sense of their own worth and divinity. “The Young Ladys of Zion are greater than the Queens of the earth,” she proclaimed in Santa Clara. In some wards, the young men and young women met together to receive counsel from the Relief Society general president and her counselor. Eliza and Zina worked together effectively as president and counselor and as sister-wives and close friends. While they did not always travel together to visit wards and stakes in and around Salt Lake City, during their five-month tour of southern settlements, they were always together. As they visited meetings of the Relief Society, young ladies, and Primary Associations, both of them generally spoke. Often at the end of these meetings, Sister Eliza arose and spoke in tongues Sister Zina interpreted. Their styles and approaches differed. 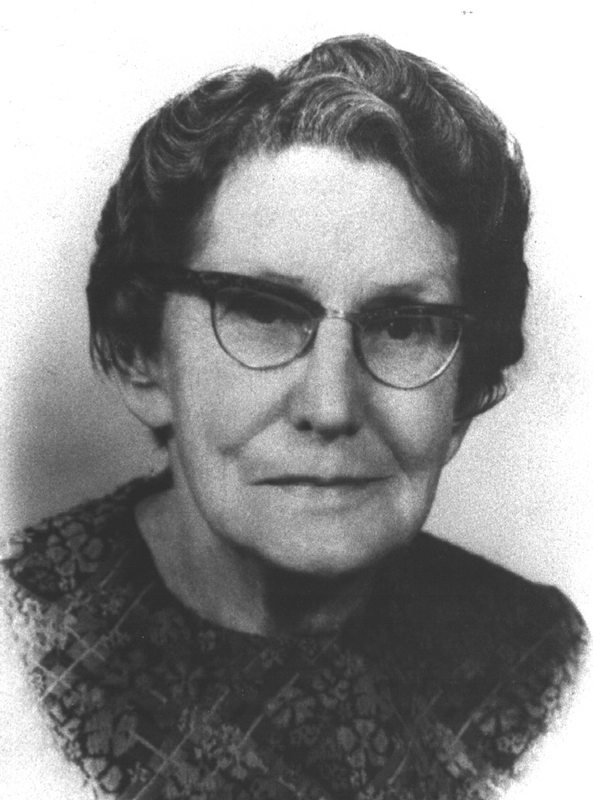 Susa Young Gates described Aunt Eliza as “keenly intellectual” and Aunt Zina as “all love and sympathy.” Indeed, Susa wrote: “Some spoke of the two as the head and the heart of women’s work in Utah.”56 Their shared visit to the southern settlements seems to have crystallized the image of their close companionship. Sister Eliza Snow Smith and Sister Zina Young epitomized strong, compassionate, and inspiring leadership and their visits and meetings reinforced the natural interrelatedness of the three women’s organizations. Counterbalancing the fast-paced organizational work Eliza and Zina carried forward were quieter days spent in and around St. George with family and friends and at the temple. Family in St. George consisted of Lucy Bigelow Young who, like Eliza and Zina, was a plural wife of Brigham Young. Brigham had asked Lucy to move to St. George in 1870 to help establish his winter home, and their three daughters—Dora, Susa, and Mabel—lived there with their mother on and off.57 In 1877, when the St. George Temple was dedicated, Brigham called Lucy to preside over women’s ordinance work there. Dora and Susa worked in the temple with her. In January 1880, Susa married Jacob Gates and their first child was born just before Eliza and Zina arrived in St. George. On November 22, Zina reported to the Woman’s Exponent, she and Eliza “called on Susa Gates, who has a beautiful baby girl two weeks old.”58 Lucy was not in St. George to greet her new granddaughter or her sister-wives. “Aunt Zina and Eliza are here, and often wish you were here,” Susa wrote her mother on 6 December. “I took the liberty to lend them your two muffs. They did not come prepared for cold weather.”59 Susa was a correspondent for the Deseret News and reported the activities of her Aunt Eliza and Aunt Zina during their five-month visit in the south. The illustrious aunts boarded with Minerva White Snow, St. George Stake Relief Society President and second wife of Erastus Snow—Eliza’s distant cousin and the member of the Quorum of Twelve Apostles with ecclesiastical responsibility for the extensive southern settlements. “Returned to Sister Minerva’s at St. George,” Zina wrote on 26 November 1880, after she and Eliza had visited nearby Santa Clara.60 “We have been here one month,” Zina recorded on 19 December, noting, “Payed Sister Manerva S $17,00.”61 Whether the women boarded at the Snow family’s Big House—the three-story executive mansion with rooms for travelers in the center of St. George—or at one of the smaller Snow residences in St. George is unclear.62 But they spent nearly as much time in Minerva’s company as with one another, since they stayed with her in St. George and she accompanied them on their visits to the southern settlements. No records have as yet come to light to further illuminate the time the women spent together. Charles Lowell Walker provides a brief glimpse of a conversation he initiated with Eliza toward the end of her visit in March 1881. “At night paid Sister Eliza R. Snow a short Visit and had some conversation with her on the Dividing of the Earth,” he wrote. Elizabeth Kane’s account of visiting St. George in 1872-73 with her husband Thomas and their sons in company with Brigham Young suggests something of the lively social life that existed in Utah’s Dixie. She writes of ward balls featuring reels, cotillions and country dances, some of which lasted until the early morning hours. The Kanes stayed at the Snow’s Big House and feasted there “in the long dining room of our Mrs. Snow.”67 Mary Ann Price Hyde, who left St. George just days before Eliza and Zina arrived, spoke of the “instrumental music rendered by members” of the Snow family, as well as a serenade by a “Juvenile brass band.”68 Of course, St. George had its own Martial Band and Santa Clara its Swiss Brass Band. The St. George Harmonic Society provided choral music and the St. George Dramatic Association presented theater productions.69 Tom Taylor’s four-act The Ticket-of-Leave Man played while Zina and Eliza were in town. The extent to which the two women partook of these social entertainments is unknown, but the record clearly places them at other entertainments, namely three significant birthday parties in which they played a leading role: one for Eliza, one for Zina, and one for the Prophet Joseph Smith. of the Birth of Sister Zina D. H. Smith. Yourself and Ladies Respectfully Invited. Dancing at 7 o’clock sharp. The previous December Charles Lowell Walker recorded “a social gathering of the Seventies” when both Eliza and Zina were present and many people shared “early reminiscences of the Prophet Joseph.”73 According to James Godson Blake, on 23 December 1880 at two o’clock in the afternoon there was “a general meeting commemorative of the Birth of the Prophet Joseph Smith 75 years ago to day. We had 2 of Bro. Jos. Smith’s wives with us Eliza Roxey Snow Smith and Zina Diantha Huntington Smith.”74 Another gathering was held that evening “in continuation of the celebration,” including “as many invited guests as could be seated in the [Social] Hall,” Eliza wrote in a brief letter published in the Woman’s Exponent.75 Zina’s brother Oliver B. Huntington, also then visiting St. George, recorded that in the evening “The hall was filled with the picked faithful saints of St. George.”76 The afternoon meeting featured speeches by four members of Zion’s Camp and by George Omer Noble, widely known as “the first child born in plural marriage.”77 At the evening meeting Susa Young Gates read a poem Eliza had composed for the occasion. The seventy-four lines of iambic pentameter couplets praise the unique gifts and mission of the Prophet and emphasize the restoration of the priesthood and temple ordinances. The worthy living and the dead to bless. Eliza and Zina began working in the St. George Temple on Wednesday, 24 November 1880, six days after they arrived in St. George. For five weeks, they spent nearly every Wednesday, Thursday, and Friday in temple service. Due to their travels, their schedule was less regular after that, but they approximated that routine when they could and ultimately spent a total of thirty-nine days in the St. George Temple, more than one-fourth of their total time in the south. Zina had been present when some rooms in the St. George Temple were dedicated in January 1877.82 Though Eliza had composed a hymn text sung at the more extensive dedication of the St. George Temple in April 1877, she apparently did not attend.83 Her absence from both dedicatory events, whatever the cause, must have pained her. She had been a recorder in the Nauvoo Temple and had officiated in temple ordinances for the living in Salt Lake City since 1853, first at the Council House and later in the Endowment House. The temple at St. George opened the way for Saints to perform temple ordinances for the dead, a work reserved by divine revelation for temples. “We’ve been baptiz’d for them, and now, / As agents, in their stead, / We’re wash’d and we’re anointed too – / The living for the dead,” Eliza had written in her St. George “Temple Song.”84 A page from Eliza’s 1842-1882 Journal lists deceased family members and friends for whom she had been baptized in Nauvoo and Salt Lake City.85 But Eliza’s performance on their behalf of the ordinances of washing and anointing, endowment and sealing awaited her long sojourn in St. George. On the morning of Wednesday, 24 November, Eliza and Zina were undoubtedly already inside the temple at ten o’clock when drizzling rain turned into a downpour. “Sister Eliza R. Snow and Zina Young came to the Temple to day and felt much pleased and gratified in having the glorious privellege of entering in and participating the ordinances of the Temple of God,” Charles L. Walker noted in his diary on the women’s first day at the temple.86 That Wednesday, Eliza completed one endowment—a sacred temple rite of washing and anointing, instruction and covenant—on behalf of her deceased mother, Rosetta Leonora Pettibone Snow. Rosetta had died in Illinois in October 1846, estranged from the church she had eagerly joined in 1831, four years earlier than Eliza, the second of her four daughters. On Thursday, 25 November, Eliza completed the endowment on behalf of the third of Oliver and Rosetta Snow’s daughters, Percy Amanda Snow McConoughey, who had died in Illinois in 1848, never having affiliated with the Latter-day Saints. On Friday, 26 November, Eliza performed the endowment ritual on behalf of her sister Melissa Snow, the youngest Snow daughter who had died in 1835 at age twenty-five in Eliza’s hometown of Mantua, Ohio.87 Decades earlier, Eliza and her oldest sister, Leonora Abigail Snow Leavitt Morley (1801-1872), had performed the holy ordinances for themselves. Now, after three days in the St. George Temple, Eliza had the satisfaction of knowing that the rituals she considered “saving ordinances” had been performed for all the female members of her immediate family. Zina, sixty-years old, performed dozens of baptisms for the dead, while Eliza, at age seventy-seven, did none. Both women were involved in sealing ordinances for the dead, including the sealing of huband to wife and the sealing of parents to children. Most of these were “adoptive sealings,” that is the sealing of deceased women not to their own husbands, but to prominent, faithful priesthood leaders such as Joseph Smith and Brigham Young. Children likewise were sealed not to their own parents, but rather “adopted” by the sealing ordinance into the family of a priesthood leader. Thus anyone, regardless of the faithfulness of spouse or parents, could be “adopted into the chain of the priesthood in order to reach the highest glory of the celestial kingdom.”89 Eliza was proxy for eight deceased women who were sealed as wives to the Prophet Joseph Smith, including her sisters and nieces. On three days she participated in sealing ordinances as long lists of individuals, men and women, were “adopted” as children to the Prophet. On 23 December 1880, the birthday of the Prophet Joseph Smith, Eliza completed the endowment for Hannah Ells Smith (1813-1845) who, like Eliza and Zina, had been sealed to Joseph Smith as a plural wife in Nauvoo. Eliza had been present at Hannah’s death in the home of Hiram and Sarah M. Kimball in 1845 and later recalled, “I loved her very much.”90 Thus, Eliza brought saving ordinances not only to her own family, but to Joseph’s family, which she enlarged through adoptive sealings. Eliza and Zina worshipped God in the St. George Temple by there performing sacred ordinances for women, most of whom they had known and loved and whose memory they cherished. A month after she returned from her extended stay in Southern Utah, Eliza told Relief Society women in her own ward that she “had great satisfaction while working at the Temple in St. George. Felt that she was near to heavenly beings. The more we officiate in the Temple, the more we realize the responsibility that rests upon us for our dead.”91 During the last six years of her life, she would turn to genealogy and family history with greater intensity than before. We, the sisters of the R. S., most sincerly [sic] welcome these, our much beloved sisters, to Kanab. A long cherished hope is realized in the happy event. Here, on the frontier of Utah, in comparative isolation, it is the first time that any of our representative ladies, have visited us. Therefore, we say to them welcome, thrice welcome; and may this visit be long remembered by us, as a time of rejoicing. May we treasure of the counsels we received as precious gems. We welcome you as Lady Pioneers to this beautiful, but once desert Territory; for by your untiring efforts, you have greatly aided in developing refinement and social advancement among the Saints. We welcome you as veritable Mothers in Israel, for your lives have been given to good works, and to the accomplishment of holy purposes. We welcome you, as the early exponents, by precept and example, of the new and everlasting covenant of Marriage, and as leaders in the self-sacrifice at first necessary to establish its principles. The tribute illustrates the extent of Latter-day Saints’ respect for Eliza and Zina’s religious authority, in its many facets. To understand the full impact of Eliza’s ministry and her extraordinary status, one must recognize that she was an integral part of the church’s patriarchal order, its greatest patriarch being her husband Joseph Smith. At the same time, through her work with the women’s organizations, she was at the center of the Church’s ecclesiastical order. Family and church structures, patriarchal and ecclesiastical orders merged in her life. In this regard, she reflected the Mormonism of her time. As Eliza worked indefatigably to forge institutional roles for Mormon women in the Relief Society, the Young Ladies Mutual Improvement Association and Primary Association, she helped establish the ecclesiastical structures that would hold Saints together in the tumultuous years to come years when the extensive patriarchal covenant organization, buttressed by plural marriage and adoptive sealings, would gradually be transformed into an emphasis on individual monogamous families, each with a presiding patriarch, and sealings to one’s own kin. 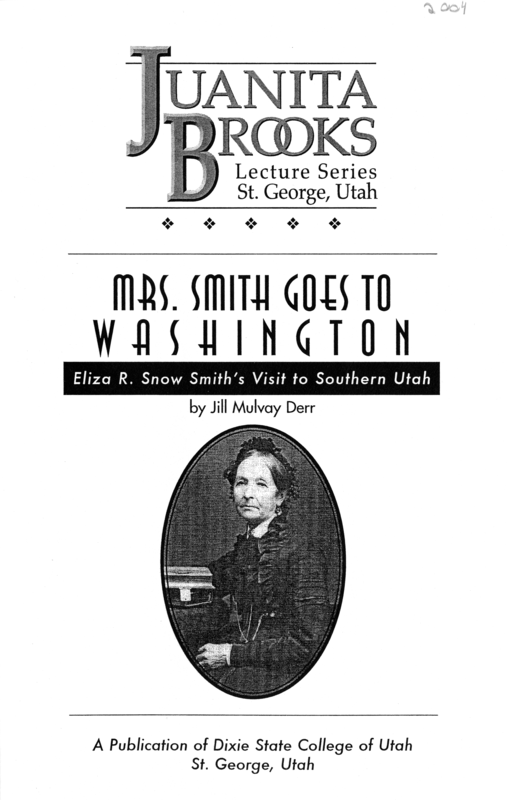 Eliza R. Snow Smith’s southern tour with her counselor and friend Zina D. H. Young remained fixed in the memory of Latter-day Saints for more than a generation. The southern Saints witnessed Eliza at the crowning point of her ministry, a moment when all facets of her powerful personal and public presence came together. The wife of Joseph Smith and Brigham Young, she was in her own right poetess, prophetess, priestess, and presidentess. Though she was legendary, she was accessible. The Saints in Washington and surrounding counties remembered her strength and authority, but also her warmth and comforting kindness. Elizabeth Little of Kanab suggested in her flowery tribute to Eliza and Zina that long after they had passed from this world, they would leave in Utah’s desert places some enduring presence. “The bright halo of their great and noble souls will float around us,” she predicted, “like the glory of the departed day or the gentle breeze of a Summer evening.”99 The tenderness of that memory is a tribute not only to Aunt Eliza and Aunt Zina, but also to the faithful, hospitable southern Saints they visited. An earlier version of this paper was presented at the annual conference of the Mormon History Association, 17 May 2002, Tucson, Arizona. The author gratefully acknowledges Maureen Ursenbach Beecher who collected over many years significant documents related to this trip, which are currently on file at the Joseph Fielding Smith Institute for Latter-day Saint History at Brigham Young University. Wendy Parker, Anissa Olson Taylor, and Jennifer Reeder provided invaluable research assistance. Eliza R. Snow Smith, “Sketch of My Life,” in Maureen Ursenbach Beecher, ed., The Personal Writings of Eliza Roxcy Snow (Salt Lake City: University of Utah Press, 1995), 37. Augusta Joyce Crocheron, Representative Women of Deseret (Salt Lake City: J. C. Graham Company, 1884) and accompanying composite photograph; Emmeline B. Wells, “Pen Sketch of an Illustrious Woman,” Woman’s Exponent 10 (15 July 1881): 27. Snow Smith, “Sketch of My Life,” in Beecher, Personal Writings of Snow, 37 Beecher’s marks designating which words Snow inserted have been deleted and bracketed material has been added. Autobiography of Violet Lunt Urie, typescript, LDS Church Archives, The Church of Jesus Christ of Latter-day Saints, Salt Lake City, Utah, hereafter cited LDS Church Archives. See Solomon F. Kimball, “President Young’s Excursion Party,” Improvement Era 14 (January 1911): 188-201, and continued in the Era of February, March, and April 1911. The most significant work to date on Zina Diantha Huntington Jacobs Smith Young is Martha Sonntag Bradley and Mary Brown Firmage Woodward, Four Zinas: A Story of Mothers and Daughters on the Mormon Frontier (Salt Lake City: Signature Books, 2000). See also Todd Compton, In Sacred Loneliness: The Plural Wives of Joseph Smith (Salt Lake City: Signature Books, 1997), 71-113. The 19 June 1880 nomination and sustaining of Eliza R. Snow as “president of all the Relief Societies” is recorded in “Salt Lake Stake Relief Society Conference,” Woman’s Exponent 8 (1 July 1880): 21-22. The setting apart of the Relief Society central board or general presidency nearly a month later is recorded in “Minutes of a general meeting held in Fourteenth Ward Assembly Hall, July 17th, 1880,” under “Relief Society Reports,” Woman’s Exponent 8 (1 September 1880): 53. The importance of both meetings is discussed in Jill Mulvay Derr, Janath Russell Cannon, and Maureen Ursenbach Beecher, Women of Covenant: The Story of Relief Society (Salt Lake City, UT: Deseret Book, 1992), 121-122. Maureen Ursenbach Beecher, “Eliza R. Snow’s Relief Society Travels (1880-81),” S. Kent Brown, Donald Q. Cannon, and Richard H. Jackson, eds., Historical Atlas of Mormonism (New York: Simon and Schuster, 1994), 106-107, 155. “Going South,” Deseret News, 3 November 1880, 625. Payson Ward, Utah Stake, Relief Society Minutes, vol. 1, 1868-1877, 26 September 1872, holograph, LDS Church Archives. The spelling of the secretary has been standardized. Orson Pratt Address, 29 August 1852, Journal of Discourses, 26 vols. (Liverpool and London: Latter-day Saints’ Book Depot, 1855-1886; reprint, Salt Lake City, 1967), 1: 58. Roger D. Launius, Joseph Smith III: Pragmatic Prophet (Urbana and Chicago: University of Illinois Press, 1988), 190. Launius discusses establishment of the Reorganized Church of Jesus Christ of Latter Day Saints (now known as the Community of Christ) and Joseph Smith III’s efforts to dissociate his father and the RLDS Church from the practice of plural marriage. The full quotation reads: “I believe my father was a good man, and a good man never could have promulgated such doctrines.” Saints’ Herald 1 (May 1860): 101-105. Emma Smith’s encounter with and opposition to plural marriage is examined in Linda King Newell and Valeen Tippetts Avery, Mormon Enigma: Emma Hale Smith: Prophet’s Wife, “Elect Lady,” Polygamy’s Foe (Garden City, New York: Doubleday & Company, Inc., 1984). For the missionary and political campaigns of Joseph III and the RLDS, see Launius, Joseph Smith III, Chapters 9, 10, and 11. Roger D. Launius, Joseph Smith III, Chapters 9 and 10; Valeen Tippetts Avery, From Mission to Madness: Last Son of the Mormon Prophet (Urbana and Chicago: University of Illinois Press, 1998), 87-113, 164-179. Eliza R. Snow to Editors Deseret News, 17 October 1879, in “Joseph the Seer’s Plural Marriages. His Wife Emma’s Consent Thereto,” Deseret News, 18 October 1879, 2, reprinted in Woman’s Exponent 8 (1 November 1879), 84. “The Last Testimony of Sister Emma,” Saints’ Advocate 2 no. 4: 49-52, is discussed at length in Newell and Avery, Mormon Enigma: Emma Hale Smith, 300-302. The decision in the Reynolds case is thoroughly discussed in Sarah Barringer Gordon, The Mormon Question: Polygamy and Constitutional Conflict in Nineteenth Century America (Chapel Hill and London: The University of North Carolina Press, 2002), 119-145. The decision in Reynolds was issued the month before Emma Smith’s sons interviewed her. Indeed, Valeen Tippetts Avery suggests the Smith sons conducted the interview because they felt “pressured by the national conflict over polygamy.” Avery, From Mission to Madness, 256. Eliza R. Snow, “Decision of the Supreme Court of the United States in the Reynolds Case,” dated 21 January 1879, in Deseret News, 21 January 1879; also printed as a broadside. Snow to Deseret News Editors, 17 October 1879. “Editorial Notes,” Woman’s Exponent 8 (15 May 1880): 185. [Utah] Davis Stake Relief Society Minutes, 1878-1887, 16 July 1880, holograph, LDS Church Archives. During the 1880-81 trip south, Zina D. H. Young was frequently listed as “Zina D. H. Smith,” particularly in St. George Temple records. Emily Dow Partridge Young added “Smith” to her signature in her journal on 12 July 1880. Journal of Emily Dow Partridge Young, typescript, 52, Special Collections, J. Willard Marriott Library, University of Utah, Salt Lake City. “Eliza R. Snow Smith” is the name carved in the stone that marks her grave in Brigham Young’s private cemetery in Salt Lake City. Zina D. H. Young Journal, 1880, holograph, L. Tom Perry Special Collections, Brigham Young University, Provo, Utah, 11 November 1880. “Special meeting of the Kanosh Relief Society…,” Woman’s Exponent 9 (1 December 1880): 102. Diary of Samuel Rogers, 15 November 1880, LDS Church Archives; “Parowan Relief Society Conference,” Woman’s Exponent 9 (15 December 1880): 106. “Home Affairs,” Woman’s Exponent 9 (15 December 1880): 109. “Home Affairs,” Woman’s Exponent 9 (15 January 1881): 124. Rockville Ward, Relief Society Minutes and Records, 4 January 1881, LDS Church Archives. Myron Abbott Diary, typescript, 26 January 1881, L. Tom Perry Special Collections, Harold B. Lee Library, Brigham Young University, Provo, Utah. E.R.S.S., “Trip to Kanab,” Woman’s Exponent 9 (15 March 1881): 157. Thomas Chamberlain Diary, photocopy of holograph, L. Tom Perry Special Collections, Brigham Young University, 20 February 1881. “Kanab Relief Society,” Woman’s Exponent 9 (1 April 1881): 165-66. E.R.S.S., “Trip to Kanab,” 157. LaHarpe to Editor Deseret News, 28 March 1881, Deseret News, 13 April 1881, 163. George Eyre to Editor Deseret News, 6 April 1881, Deseret News, 20 April 1881, 191. “Home Affairs,” Woman’s Exponent 9 (15 April 1881), 172. Holden Ward, Millard Stake, Relief Society Minutes and Records, November 1880, LDS Church Archives. St. George First Ward, St. George Stake, Relief Society Minutes, 1877-1895, 2 December 1880, LDS Church Archives. Scipio Ward, Millard Stake, Relief Society Minutes and Records, 9 November 1880. “Parowan Relief Society Conference,” Woman’s Exponent (15 December 1880): 106. “Kanab Relief Society,” Woman’s Exponent 9 (1 April 1881): 165. “Special meeting of the Kanosh Relief Society…,” Woman’s Exponent 9 (1 December 1880): 103. Santa Clara Ward, Relief Society Minutes, 27 November 1880, LDS Church Archives. Santa Clara Ward, Relief Society Minutes, 28 December 1880, LDS Church Archives. “Brigham Young Academy,” Woman’s Exponent 10 (1 July 1881): 16. Santa Clara Ward, St. George Stake, Relief Society Minutes, 27 November 1880, LDS Church Archives. Virgin City Ward, St. George Stake, Primary Minutes, 6 January 1881, LDS Church Archives. Scipio Ward, Millard Stake, Primary Association Minutes and Records, 9 November 1880, LDS Church Archives. Washington Ward, St. George Stake, Primary Minutes, 1880-1887, 19 November 1880, LDS Church Archives. Pine Valley Ward, Primary Minutes, 1880-1883, 4 December 1880, LDS Church Archives. St George First Ward, Primary Minutes, 1880-86, 29 November 1880, LDS Church Archives. The books compiled by Eliza R. Snow Smith included: Hymns and Songs …for the Primary Associations of the children of Zion (Salt Lake City: Deseret News Printing and Publishing Establishment, 1880); Bible Questions and Answers for Children (Salt Lake City: Juvenile Instructor Office, 1881); and Recitations for the Primary Associations, 2 vols. (Salt Lake City: Deseret News Company, Printers and Publishers, 1882). Susa Young Gates, History of the Young Ladies’ Mutual Improvement Association of the Church of Jesus Christ of Latter-Day Saints from November 1969 to June 1910 (Salt Lake City: The Deseret News, 1911), 21. The move also served to distance Brigham and Lucy’s oldest daughter Dora from an alcoholic suitor. Susa Young Gates, “From Impulsive Girl to Patient Wife: Lucy Bigelow Young,” Utah Historical Quarterly 45 no. 3 (summer 1977): 270-88. “Home Affairs,” Woman’s Exponent 9 (15 December 1880): 108. Susa Young Gates to Lucy Bigelow Young, 6 December 1880, holograph, Susa Young Gates Collection, Utah Historical Society, Salt Lake City. Zina D. H. Young Journal, 1880, 19 December 1880. Information on the Big House is found in Andrew Karl Larson, Erastus Snow: The Life of a Missionary and Pioneer for the Early Mormon Church (Salt Lake City: University of Utah Press, 1971), 599-614. Eliza’s relationship with Hannah Gould Perkins (1808-1893) is discussed in Jill Mulvay Derr, “To Nurture and Be Nurtured: The Friendships of Eliza R. Snow,” May Christ Lift Thee Up: Talks from 1998 Women’s Conference Sponsored by Brigham Young University and the Relief Society (Salt Lake City: Deseret Book Company, 1999), 99-101. Johnson Ward, Kanab Stake, Relief Society Minutes, 22 February 1881, LDS Church Archives. A. Karl Larson and Katharine Miles Larson, eds., Diary of Charles Lowell Walker, 2 vols. (Logan, Utah: Utah State University Press, 1980), 10 March 1881, 540. In an 1851 poem Eliza articulated her understanding that across time the size of the earth has been reduced because various segments have been broken off which will ultimately be restored. Eliza R. Snow, “Address to Earth,” Deseret News, 31 May 1851; also in Eliza R. Snow, Poems, Religious, Historical, and Political, vol. 1 of Poems, Religious, Historical, and Political (Liverpool and London: F. D. Richards, 1856), 153-55. A Gentile Account of Life in Utah’s Dixie, 1872-73: Elizabeth Kane’s St. George Journal, Preface and Notes by Norman R. Bowen and Profile of Elizabeth Kane by Mary Karen Bowen Solomon (Salt Lake City: Tanner Trust Fund, University of Utah Library, 1995), 79-82. M.A.P. Hyde to Mrs. E. B. Wells, Woman’s Exponent 9 (1 December 1880): 99. A lively discussion of the cultural life in Utah’s Dixie is Andrew Karl Larson, I Was Called to Dixie, The Virgin River Basin: Unique Experiences in Mormon Pioneering (Andrew Karl Larson, 1961), 403-513. “Aunt Eliza’s Birthday,” Deseret News Weekly, 2 February 1881, 1. Gerald R. Sherratt Library, Special Collections, Southern Utah University, Cedar City, Utah. Larson and Larson, Diary of Charles Walker, 11 March 1881, 541. Larson and Larson, Diary of Charles Walker, 23 December 1880, 515. James Godson Bleak Journal, 23 December 1880, James Godson Bleak Collection, LDS Church Archives. “Anniversary Party in St. George,” Woman’s Exponent 9 (1 January 1881): 116-17. Diary of Oliver B. Huntington, 1847-1900, Part II, 23 December 1880, typescript, L. Tom Perry Special Collections, Brigham Young University. Diary of Oliver B. Huntington, 1847-1900, Part II, 23 December 1880; “Anniversary Party in St. George,” 116. Eliza R. Snow, “Tribute to the Birthday of the Prophet Joseph,” 23 December 1880, holograph, Eliza R. Snow Papers, LDS Church Archives; Deseret News Weekly, 2 February 1881, 2. S[usa] Y[oung] Gates to Editor Deseret News, 24 December 1880, Deseret News Weekly, 12 January 1881, 786. Diary of Oliver B. Huntington, 1847-1900, Part II, 23 December 1880. “Anniversary Party in St. George,” 117. Zina D. H. Young accompanied Brigham Young to the January 1877 dedication of parts of the St. George Temple. See Bradley and Woodward, The Four Zinas, 252. “Temple Song: Written for the Dedication of the Temple in St. George, April 6, 1877,” in Eliza R. Snow, Poems, Religious, Historical, and Political, Also Two Articles in Prose, vol. 2 of Poems, Religious, Historical, and Political (Salt Lake City: Latter-day Saints Printing and Publishing Establishment, 1877), pp. 181-82. “A Schedule of the names of persons for whom I have been baptized,” in Eliza R. Snow Journal, 1842-1882, holograph, LDS Church Archives. The journal includes daily entries for Nauvoo, 1842-1844, as well as drafts of Snow’s poetry, letters and other items dated through 1882. Larson and Larson, Diary of Charles Walker, 510-11. Information on Snow family members is drawn from Beecher, Personal Writings of Snow, 75, 232-233, 262n27. Records of baptisms, endowments, and sealings in the St. George Temple are located in Special Collections, Family History Library of The Church of Jesus Christ of Latter-day Saints, Salt Lake City, Utah. Snow, “Sketch of My Life,” in Beecher, Personal Writings of Snow, 18; Richard S. Van Wagoner, Sidney Rigdon: A Portrait of Religious Excess (Salt Lake City: Signature Books, 1994), 267. Gordon Irving, “The Law of Adoption: One Phase of the Development of the Mormon Concept of Salvation,” BYU Studies 14 no. 3 (spring 1974): 305. The practice is also discussed in Rex Eugene Cooper, Promises Made to the Fathers: Mormon Covenant Organization (Salt Lake City: University of Utah Press, 1990), 193-95. Compton, The Plural Wives of Joseph Smith, 542. Eighteenth Ward, Salt Lake City, Relief Society Minutes, 26 April 1881, holograph, LDS Church Archives. M. Elizabeth Little, “A Welcome,” Woman’s Exponent 9 (1 April 1881): 165. See Gordon Irving, “Encouraging the Saints: Brigham Young’s Annual Tours of the Mormon Settlements,” Utah Historical Quarterly 45 no. 3 (summer 1977): 233-51. Thomas Chamberlain Diary, photocopy of holograph, L. Tom Perry Special Collections, Brigham Young University, 19 February 1881. Journals from the Life and Times of Joseph Ira Earl…, comp. Owen Ken Earl, 2 vols., (Moses Lake, WA: O. K. Earl, 1986, 1988), vol. 1, 26 January 1881; vol. 2, p. 11. Mabel Knell, “Our Primary,” Juvenile Instructor 28 (1 May 1893): 301. Elizabeth P. Bentley to Editor, 28 March 1881, Woman’s Exponent 9 (15 April 1881): 173. Cynthia Ann Jolley, “Our Visit,” Woman’s Exponent 9 (15 April 1881): 176.